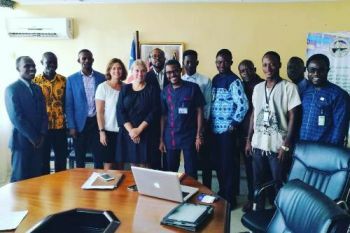 Tuesday 9 October 2018, Monrovia, Liberia In an effort to consolidate public and private stakeholders support for the ratification and implementation of the WTO Trade Facilitation Agreement in Liberia, the Ministry of Commerce and Industry in collaboration with its international partner the Swedish National Board of Trade (NBT) organized and engaged several stakeholders in the trade and commercial sector of Liberia, including Ministry of Finance & Development Planning, BIVAC, Liberia Chamber of Commerce, Liberia Immigration Services, Liberia Revenue Authority, Liberia Business Association, Ministry of Agriculture, Liberia National Brokers Association, Ministry of Transport among others. Anneli Wengelin and Alexandra Hernadi of the NBT along with Tom Tombekai and Clarence Freeman of the MoCI, Trade Facilitation Team led the Stakeholders bilateral consultative meetings. The above mentioned Stakeholders voiced their deepest preparedness and pledged to support every effort toward the ratification of the TFA by the National Legislature. Comprehensive engagement at the Legislative and Executive levels is vital and remains a prerequisite toward the successful implementation of the Agreement. A strong “Political Will” is cardinal to receiving the needed domestic support for the smooth operation of the Liberia National Trade Facilitation Committee. They also expressed their concern about the slow pace of the ratification of the TFA and urged the Government of Liberia to exert every effort aim at ratifying and implementing the agreement for the benefit of the private sector. Institutionalization of the National Trade Facilitation Committee (NTFC).